Visitors to Conche Harbour in Newfoundland, Canada can watch the pack ice melt and explore all the commercial fishing boats who have stacks of crab pots on board. These crab pots are used on a daily basis once the fishing boats can leave the harbour and bring in pounds of crab which is a way of living for many of the local residents. 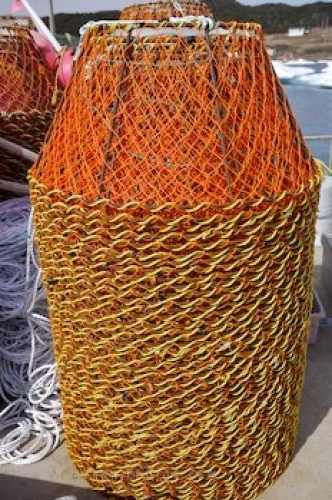 Picture of crab pots used on the commercial fishing boats in Conche, Newfoundland.